Hyundai's best-selling sedan was redesigned last year, so we didn't expect much in the way of changes for 2018. What we did get was a new trim level, the SEL, which slots between the SE and Value Edition trims, as well as a hatchback model – dubbed the Elantra GT – that's based on a different platform and built in Europe and marketed over there as the i30. Unlike the Sonata, which is now a little too conservative for our tastes, the Elantra's current design – though still toned down - still stands out from the pack by incorporating some of the best features of both the original "Fluidic Sculpture" and newer "Fluidic Sculpture 2" design languages. 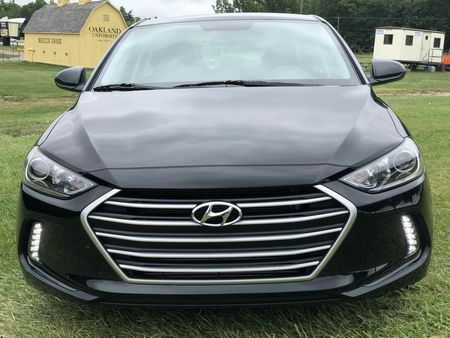 A lower, wider grille give the sedan a more substantial presence, while the sides are defined by a sculpted lower body and a pronounced upper character line that nicely with the tapered roofline. 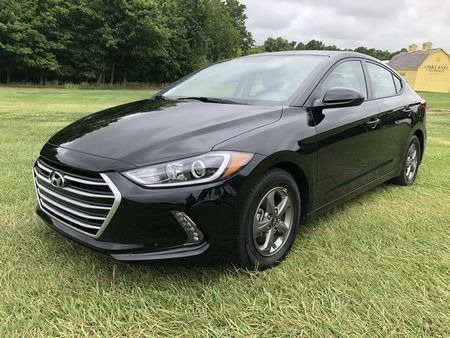 The still-slick exterior is wrapped around a cabin with 95.8 cu ft of passenger space, and a trunk that measures 14.4 cu ft (the optional gesture-controlled automatic trunk making loading easier when your hands are full) - pushing the Elantra into the EPA's midsize class. The decidedly more sedate hatchback trumps that versatility with 96.5 cu ft of passenger space, and a cargo area measuring 24.9 cu ft.
Like the more somnolent Sonata, the central controls are canted slightly towards the driver for improved ergonomics, while the seven-inch touchscreen is set into the dash at a more upright angle, reducing glare and making it much easier to read in direct sunlight. 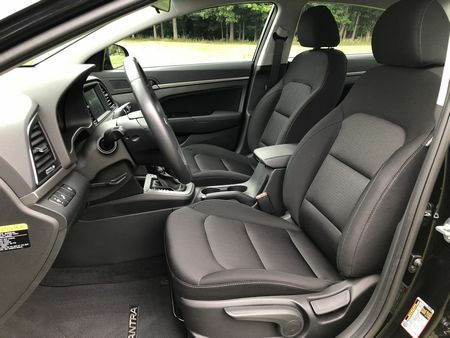 The front seats are comfortable with reasonable bolstering and Sport models are outfitted with deeper buckets covered in either a grippier cloth or optional leather. There's plenty of head and knee room in back, and, with the sedan's low rear seats, six-footers can ride in comfort. But things are hardly perfect as not all trim levels are equally quiet – the best sound insulation tweaks are reserved the most expensive Limited model. 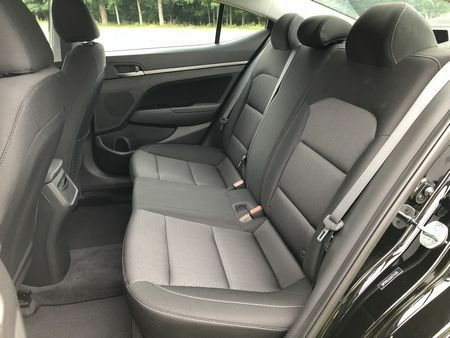 Further, the sedan's interior seems to have regressed from a design standpoint and lacks the fit, finish and material quality found in the Euro-spec hatchback GT model, while rear seat occupants aren't given the comfortable seat cushions found up front. 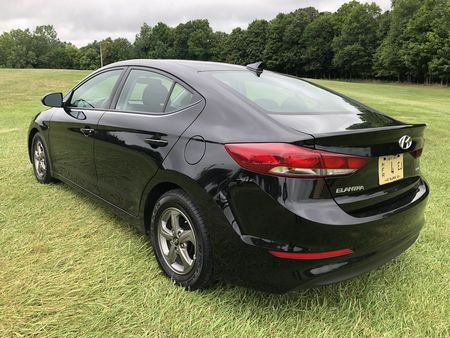 The Elantra should also work for families with two or fewer small children, although if the family expands or when those children grow older, the Elantra's cargo space limitations will crop up, and sibling separation might be insufficient to quell territorial arguments. A minivan it's not, although if it's garaged next to one, it would make a nice second car. Elantra sedans are offered with three engines, while GT models make do with two. Base versions of both come with a 2.0-liter four-cylinder that develops 147 horsepower in the sedan and 162 horsepower in the GT. Torque stands at 137 lb-ft in the sedan, and 150 lb-ft of torque in the GT. 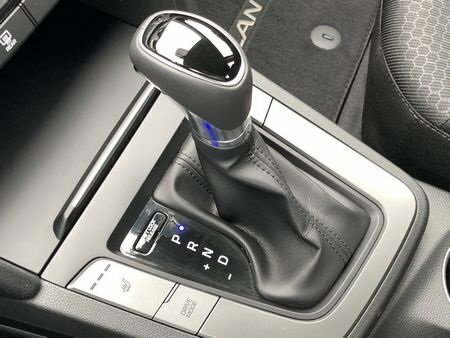 Transmission choices include either a six-speed manual or six-speed automatic. In Sport trim, both models share a 1.6-liter turbocharged four-cylinder engine that generates 201 horsepower and 195 lb-ft of torque, that can be matched to either a seven-speed dual-clutch automatic or – what we'd choose – a six-speed manual. 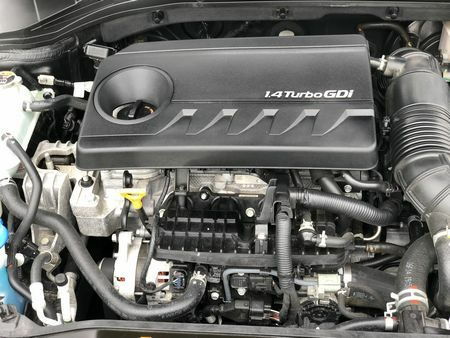 Our tester, an Eco model, rounds out the lineup with the third engine – a turbocharged 1.4-liter four-cylinder developing 128 horsepower and 156 lb-ft of torque matched with a seven-speed dual-clutch automatic. Most Elantra sedans will score an EPA-estimated 28 miles per gallon in the city, 37 on the highway, and 32 combined. Our Eco model tester stretches those numbers out to an EPA-estimated 32 mpg in the city, 40 on the highway, and 35 combined. Our own observed fuel economy was a vehicle-measured 32 miles per gallon in around-town driving. 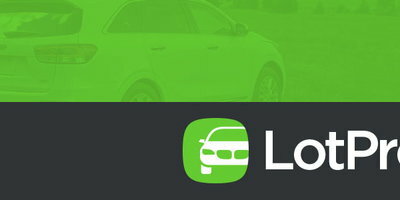 Our Eco tester may not be as affordable as the Elantras once were, but you can chalk that up to a long list of standard features that, just a few years ago, were only offered on a handful of premium vehicles. The list includes a standard 7-speed dual clutch automatic, power windows, locks and mirrors and LED daytime running lights as well as welcoming lights under the door handles that activate as you approach the vehicle. 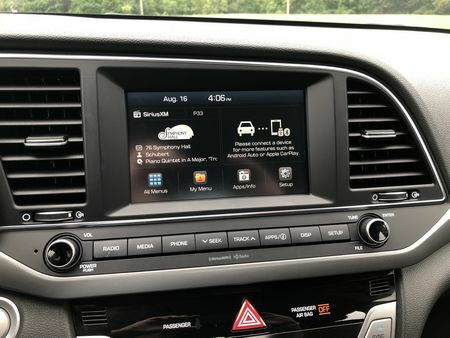 The infotainment system includes a 7-inch touchscreen, satellite radio, Bluetooth, Android Auto and Apple CarPlay. 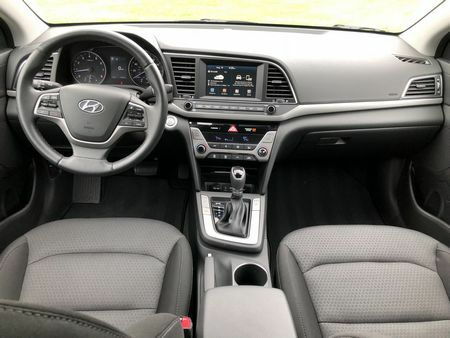 Also standard is a proximity key with push-button start, heated front seats, dual automatic climate control and a leather-wrapped shift knob and steering wheel. A rear view camera is standard across the lineup, while Eco models also come with blind spot detection and rear cross-traffic alert. Unfortunately, advanced safety features like LED headlights, automatic high-beams, adaptive cruise control, forward collision warning, and automatic emergency braking are unavailable. While it's on the soft side, the Elantra's ride is smooth and controlled with composed handling. Sport models are equipped with an independent rear suspension, but even the torsion beam setup on our Eco model didn't wallow over bumps or other road imperfection. 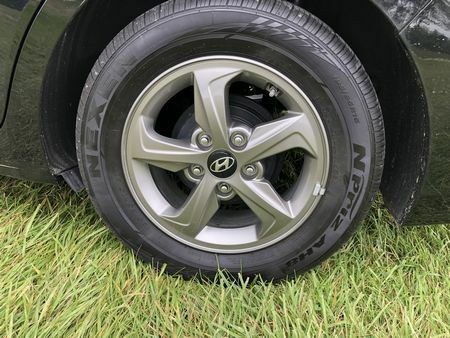 On the expressway, the Elantra felt composed with no need to constantly make corrections to the steering, and it was unaffected by crosswinds and grooved pavement. On the other hand, steering feel could be better, there's noticeable body lean during cornering, and while the brakes are easy to modulate, there isn't much initial bite to the pads, and feedback could also be improved. In addition, although the 7-speed dual clutch transmission matches up nicely with the 1.4-liter turbo, especially when cold we noticed some lag on acceleration that seemed to go away once things warmed up. Pricing for the 2018 Hyundai Elantra starts at $17,835 (including an $885 destination charge) for a six-speed manual SE, and tops out at $27,335 for one in Limited trim equipped with the $4,350 Ultimate Package. In between are the SEL and Value Edition volume models, the fuel-sipping Eco, and the Sport trim that incorporates a bit of hot small car goodness to the lineup. The bottom line for our Phantom Black Eco tester came in at $50 less than last year's model, with a base price of $20,550. $125 for floor mats and $885 for shipping and handling that brought its as-tested price to $21,560. 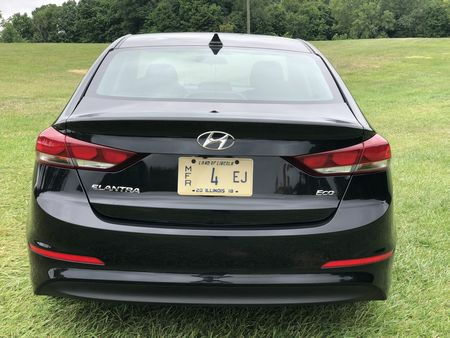 Despite a supple ride that's far from sporty, and a turbocharged 1.4-liter engine that hardly lends itself to spirited driving, there’s a lot to like about the Elantra Eco. An affordably-priced, nicely-styled compact with a roomy interior, forgiving ride and really good fuel economy, it represents a solid offering in the compact class.